Dean writes: "From Popsicle Sticks to Auto Body Primer!! 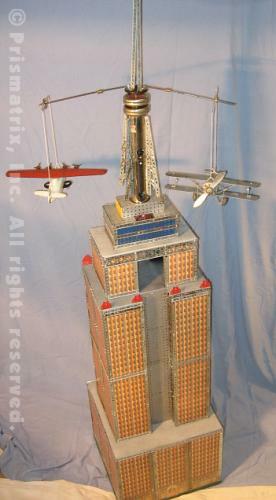 - that is what it took to complete this scratch-built 75-inch tall Empire State Building. I don't know if cutting up erector parts and improvising parts is considered acceptable to all the purists, however I will describe a little background on this model then the construction. Our vintage pre-war Standard and O gage train table was interesting, but needed more. Vintage Operating Gilbert Models Were the Ticket to Add Punch! 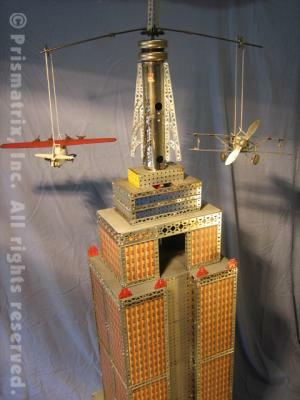 Though the parts used for the Ferris Wheel, Airplane Ride and the Merry-go-Round were old and tired - they operated fine! Something was still missing. 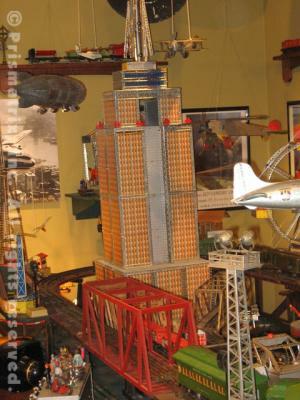 What would fit better into a pre-war train set with erector models, than an Empire State Building as originally built in 1931? Construction of the Majestic New York City Icon first included procuring a couple original Gilbert window and door skyscraper panels from the 20s, then color copying and punching. 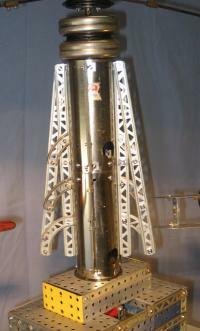 Original Gilbert snap rivets were unavailable, so nuts and bolts were improvised to hold the panels in place. The Wedding Cake approach allowed each building section to simply sit on the one below it. The base and roofs are of plywood painted with a grey auto primer. Popsicle sticks were used to internally connect the window panels so they would not "bow" inward or outward. 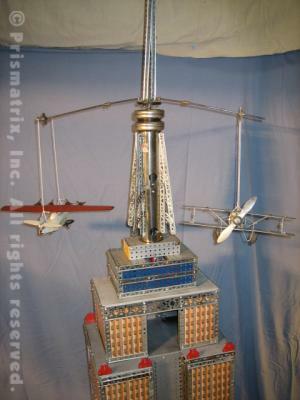 The blue observation deck section has an erector motor that spins the two airplanes around. A Steelcraft bi-wing plane from the 30s was used for one. A King Kong figure will complete the picture. The Devil is in the Details - The usual problems were encoundered in scratch building including keeping the scale somewhat accurate and keeping the model plumb and level all the way to the top. Underestimating the number of parts due to the detailing - this was a problem solved by some of your readers having spare parts available. 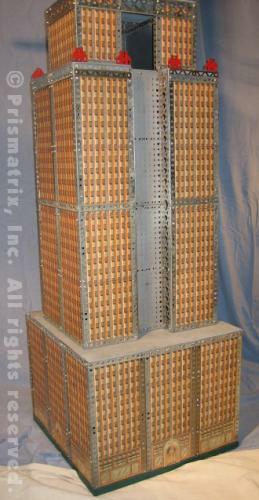 Stats - 76 skyscraper panels, near 600 bolts, 55 popsicle sticks, a few cut girders to fit the scale, around 60 pounds, 75 inches high, 18 inches square at base. Next up is to build the Parachute Jump Ride with a twist. You may have noticed the opening near the top of the building - just below the blue decks - this is to allow an elevated O gage train line to pass through and connect to the Parachute Jump Tower by bridge."